The finest American quilts of the 20th century are works of great beauty; striking design, extraordinary handwork, spectacular piecing. But beyond their appearance, these quilts tell our stories and at the same time, preserve these histories for future generations. Quiltmakers have always used this medium as a means to serve intense artistic or personal expressions. Quilts hold memories, moments, and lives. 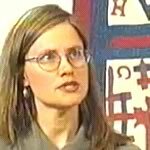 Lynn Spriggs, Curator at the High Museum of Art, Atlanta, GA discusses stories behind the Bible Scenes Quilt. The quilt's African-American maker was a member of the Drake family. Download RealPlayer to watch clip.